With Its Own Tradgedy of 1985 In Mind, Mexico Contributes Earthquake Aid To Stricken Haiti. Mexico is among the many countries contributing earthquake relief aid to Haiti, after that country was hit on January 13th by a devasting 7.0 earthquake. Haiti has a population of between 9 to 10 million people and it is feared that the death toll could run into the thousands. Mexican television has given extensive coverage in the last few days to Haiti's recent quake. And for good reason: many Mexicans still remember the Mexico City earthquake of 1985 which registered an 8.1 on the Richter scale. The result was an incredible toll of death and destruction in one of the world's largest cities. Haiti's recent quake brought back memories of Mexico's own 1985 natural disaster. On September 19, 1985, Mexico City was struck by a magnitude 8.1 (Richter) earthquake. Official tallies put the number of deaths at approximately 4,000, but some say that the number was closer to 10,000. Hundreds of buildings collapsed and thousands were damaged. Because most of Mexico City is build over an ancient lake bed, the instability of the subsoil contributed greatly to the damage. When in 1519 Hernan Cortes arrived in the Valley of Mexico, what he and his fellow Spaniards encountered was Tenochtitlan, a city built by the Aztecs on an island in the middle of Lake Texcoco. After defeating the Aztecs, the conquistadors founded Mexico City on the ruins of Tenochtitlan. Lake Texcoco with its two connecting lakes was slowly drained over the coming centuries. Today, the only remaining portion of that former immense body of water is Xochimilco with its famous canals and floating gardens. 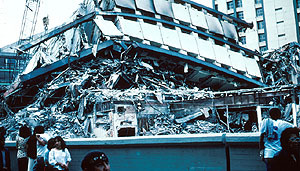 Wreckage of a 21-story steel-constructed building. It was on the seemingly dry lake bed that that Mexico City was built, growing in time to the present day metropolis of 20 million inhabitants. Though the surface lake disappeared long ago the subsoil, as part of an historic water basin, continues to be water saturated. This has been known since colonial times, but it wasn't until the 1985 quake that a truly strict earthquake building code went into effect. Present day contruction now takes into consideration the fact that the underlying ancient lake bed sediments amplify the seismic shaking in the event of an earthquake.